On May 2, 1970, a DC-9 jet with fifty-seven passengers and a crew of six departed New York’s JFK international airport en route to the tropical island of St. Maarten. The flight ended four hours and thirty minutes later in the shark-infested waters of the Caribbean. It was at the time, and remains, the only open-water ditching of a commercial jet. The subsequent rescue of survivors took nearly three hours and involved the Coast Guard, Navy, and Marines. 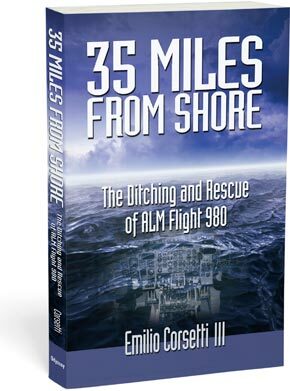 In this gripping account of that fateful day, author Emilio Corsetti puts the reader inside the cabin, the cockpit, and the rescue helicopters as the crews struggle against the weather and dwindling daylight to rescue the survivors who have only their life vests and a lone escape chute to keep them afloat.